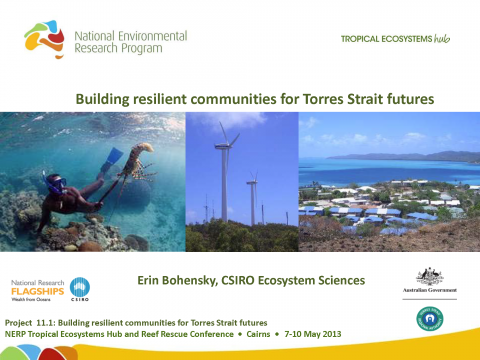 Erin Bohensky (CSIRO); Building resilient communities for Torres Strait futures; Wednesday 8th May 2013. Geoff Jones (JCU); Dave Williamson, Hugo Harrison, Jeff Leis, Lou Mason, Severine Choukroun, Michael Berumen, Jessica Hopf, Sean Connolly, Glenn Almany, Ashley Frisch. 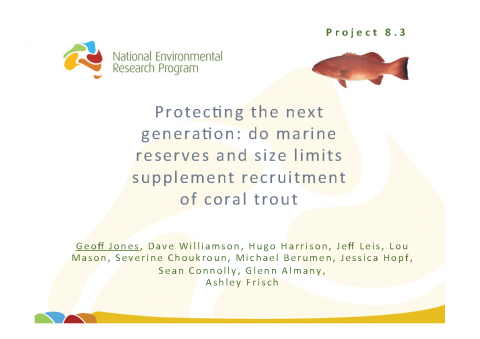 Protecting the next generation: do marine reserves and size limits supplement recruitment of coral trout. Wednesday 8th May 2013. 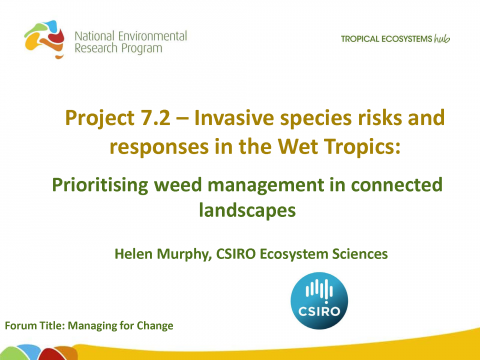 Helen Murphy (CSIRO); Prioritising weed management in connected landscapes; Tuesday 7th May 2013. 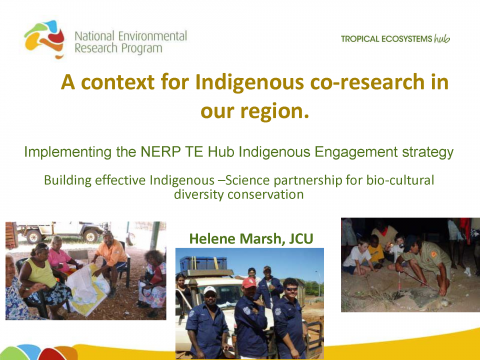 Helene Marsh (JCU); A context for Indigenous co-research in our region. Implementing the NERP TE Hub Indigenous Engagement strategy. Building effective Indigenous –Science partnership for bio-cultural diversity conservation; Tuesday 7th May 2013. 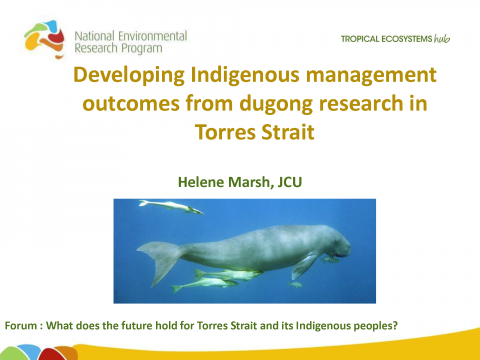 Helene Marsh (JCU); Developing Indigenous management outcomes from dugong research in Torres Strait; Wednesday 8th May 2013. 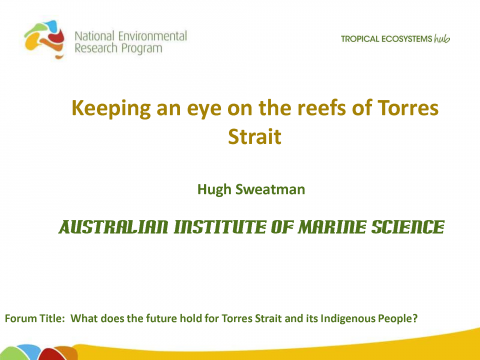 Hugh Sweatman (AIMS); Keeping an eye on the reefs of Torres Strait; Wednesday 8th May 2013. 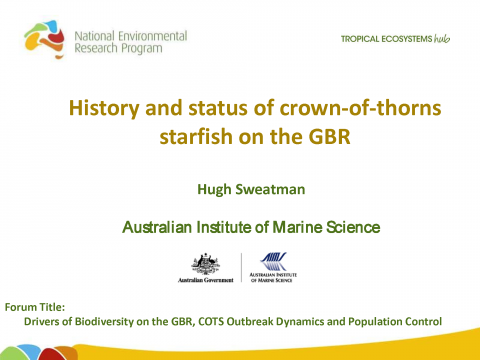 Hugh Sweatman (AIMS); History and status of crown-of-thorns starfish on the GBR; Wednesday 8th May 2013. 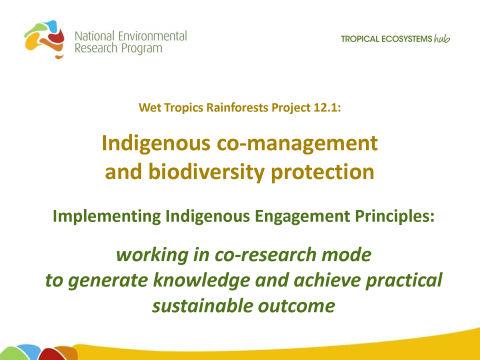 Joann Schmider; Indigenous co-management and biodiversity protection Implementing Indigenous Engagement Principles: working in co-research mode to generate knowledge and achieve practical sustainable outcome; Tuesday 7th May 2013. 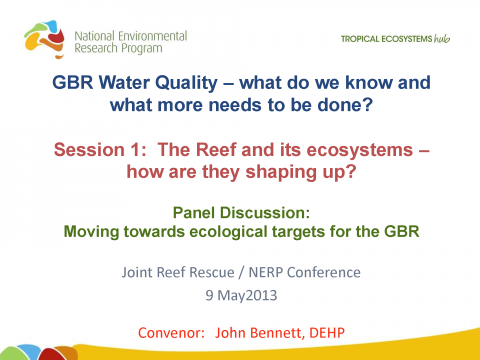 John Bennett (DEHP); GBR Water Quality – what do we know and what more needs to be done? The Reef and its ecosystems – how are they shaping up? ; Thursday 9th May 2013. 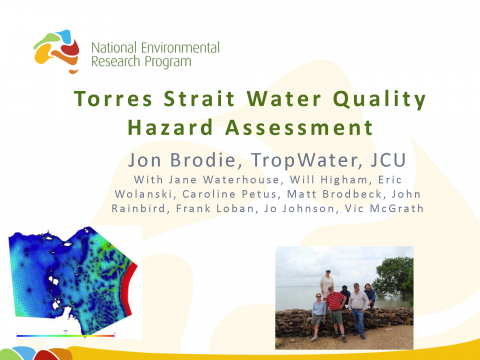 Jon Brodie (JCU), Jane Waterhouse, Will Higham, Eric Wolanski, Caroline Petus, Matt Brodbeck, John Rainbird, Frank Loban, Jo Johnson, Vic McGrath; Torres Strait Water Quality Hazard Assessment; Wednesday 8th May 2013.